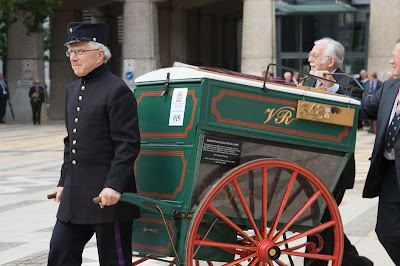 Although only ceremonial now, the tradition of cart marking goes back to the 16th century. An early form of protectionism for the industry of carmen. The city granted them certain rights to enter the city and carry goods. In exchange the carmen kept the streets clean and charged reasonable rates. Remember around medieval times sewerage was one of the biggest problems in the streets. The ceremony now has a line up of 46 vehicles ranging from horse-drawn to modern electric and hybrid engine buses and trucks. Each coming to have their number branded on a wooden plaque attached to the vehicle. The branding is carried out by the Master Carman and the Lord Mayor of London. The Master Glove Maker gets a look in presenting each of the 'branders' with a set of gloves to protect their hands during the process. There's always something new to learn in your blog, Mo! As well as charming or impressive London sites to see...THANK YOU! Nice portrait of a cart man! Colorful photo with some long history behind it! I just adore these medieval traditions of yours! This is another fascinating ceremony! I love how the traditions are kept up. In the U.S. we tend to just throw everything away. What a great story and photo. I had no idea and this history is so interesting. a great picture showing a part of London's great heritage. I sometimes see something similar on Pall Mall in the mornings. I know I haven't seen almost anything in London since I started following your blog... I can't wait to go back there! The guy pulling a cart seems he's either about to have a hear attack or burst laughing. I hope it's the latter. Nice shot! :) Keep 'em coming! Wonderful post! I enjoyed reading the information you have provided us. This reminds «Louis» somehow of another British anachronism («Louis» has embarrassingly forgotten the name of), a post Winston Churchill was once given while he was wandering in the political wilderness before WWII. The need for the job had long been gone, but the appointment had been continued. This is an eye opener. Never knew any of this. Captured a real peek into a lost world. This could only be in Britain! Nice! I love these old ceremonies. I love that kind of history, see? You can keep the politics and the kings and queens, just tell me how ordinary people lived their lives and what they used in the process and I'm happy for hours. I've still not seen this ceremony. Thanks for sharing more on this tradition.